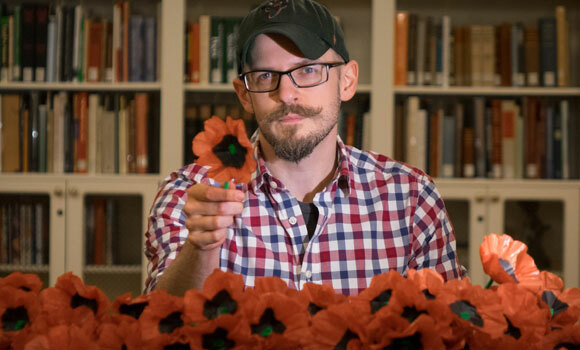 UNCG graduate student Jason Baum handcrafted 1,634 poppies to serve as the centerpiece of his museum studies capstone project, "Battlefield to Ball Field." The poppies represent the individuals from Greensboro who served in WWI. On April 6, 1917, the United States entered World War I, an act that impacted the lives of millions and forever altered the course of history. Nearly 100 years later, UNCG graduate student and Army veteran Jason Baum is telling the story of the war from the perspective of those who were impacted most: twenty-somethings. And he’s hoping millennials will listen. Baum, who will earn a master’s degree in history with a concentration in museum studies in May, has been working on his capstone project “Battlefield to Ball Field” since August. Having served in the Army for four years – including a deployment to Afghanistan in 2013 – Baum was compelled to use his project as a way to take part in the WWI Centennial Observation. His exhibit, which will be on display for the public on Saturday, April 16, from 9 a.m. to 5 p.m. at War Memorial Stadium in Greensboro, seeks to tell the story of the war and its effect on the Greensboro community, specifically young adults. Throughout these main sections, participants will take a trip back in time to learn more about the economy during the early 1900s, the rise of technology, training for soldiers and Greensboro’s contributions to the war. Afterward, participants will walk onto the field, which will be transformed into a mini “Flanders Field” and covered with 1,634 poppies – handcrafted by Baum – to represent the individuals from Greensboro who served in the war. At the conclusion of the exhibit, Baum hopes millennials will walk away with an opinion.